Nightmares are regular horses, raised on a special diet of salt, from the paraelemental plane of salt, collected near the negative energy side. They seek tragedy and ruins, decayed battlefields and mass graves, because that is where celestial and infernal stallions carry the dead to the afterlife. The nightmare is a dream of a wicked man, potent and unfulfilled. They lack control and their personal ambitions release ethereal miasma. This mist can become different kinds of aberrations, those related to majesty and freedom become mares of the night. They are ridden by champions of evil, because they seek those who have the drive their creators lack. The dreamstuff nightmares are made up ignites in the waking world. Anyone who weathers the most terrible dream a nightmare can deliver is immune to any harm. They are possessed by a fiery demon, because hell creatures need steeds too. 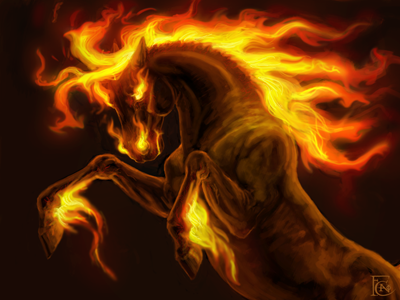 Flame Stomp: By slamming their hooves into the ground, Nightmares may produce a flaming burst. This affects all opponents to the front or front sides of the nightmare. They take 1d6+8 damage from the flames, a saving throw versus breath weapon (Or Reflex, Dex based) will give 1/2 damage. The ecology series is a crowdsourced series of articles, and contributors can be found on google+ under the hashtag #crowdecology. They are limited posts, but following me on G+ will allow you to see them. All artwork is credited where the artist could be found. Classic ecology articles from Dragon magazine are used both for reference and inspiration; the whole impetus of the idea was to create 'classic' ecology articles that are actually useful. Let's Read the Monster Manual by Noisms is also a source of inspiration.